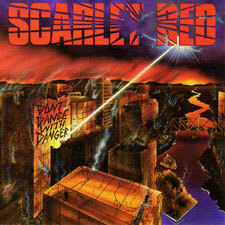 Scarlet Red were an American heavy metal band with a decisively glam image. 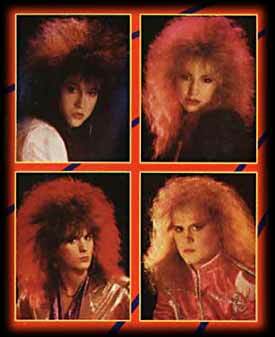 Originally formed in the early 1980's under the name Lust, the band later changed their name to Scarlet Red, apparently after becoming Christians. The band recorded the track "You Live Fast" for The Axemen compilation in 1988 before releasing their debut Don't Dance With Danger on Pure Metal Records the following year. High gloss, hair to the sky, glam, heavy metal. These guys were doing their part to keep AquaNet in business and would have made Poison proud. The band photo is hysterical. Can you tell which of the four band members is the girl singer? HA! This band would give Nitro a fight for the most outrageous glam look. Unfortunately the band's image masks what is some decent 1980's heavy metal. The opening track "You Live Fast" is a fantastic song with a smokin' guitar lead. Had this song been recorded by Stryper, Motley Crue or W.A.S.P., I imagine the song could have been at least a minor hit. Actually, early Crue and Stryper are a good point of comparison for Scarlet Red's sound. "Never" is a mid-paced song with an anthem chorus that will have most fans of 80's anthems singing along; "Never, never, to late to change." The title track has a similar anthem/sing-along quality. "Fight Fire"and "Lost and Found" are both high-energy barn burners. "Knock Down the Walls" is a very moving and touching song that vocalist Danis sings with a convincing, wonderful emotion. As well, "Why" is an emotional, melancholy ballad. The album closes with a standout cut in the furious "Break the Chains". Unfortunately the band seems a bit tamer than I imagine they might have sounded live. The production isn't bad for a band on a small label in the 1980's. Unfortunately, this is the only album this band ever recorded. As far as I know, as of 2008, this CD has yet to be re-released and is quite rare. On the rare occasion that it shows up on Ebay it usually sells for between $30 and $50. It's a shame this band only recorded this one album, although I think I remember seeing and add for a demos collection in HM Magazines many years ago.